From the 06. to the 08. February 2018, the largest American medical technology fair, Medical Design & Manufacturing (MD&M) West, took place in Anaheim / California. The MD&M West is one of the most important trade fairs in the industry for the development, production technologies and production of medical devices and with approx. 2.200 exhibitors attracts more than 35,000 visitors from all over the world every year. On the initiative of VDMA Arbeitsgemeinschaft Medizintechnik, there was a German joint pavilion for the first time as part of the foreign trade fair program of the German Ministry of Economic Affairs - German Pavilion. As part of this corporate community exhibition, RoweMed participated for the first time in the company's history as an exhibitor at an American medical technology trade fair. Under the umbrella brand "Made in Germany", RoweMed presented the company's know-how and its own products in a professional and appealing atmosphere. RoweMed was represented by Key Account Manager Christiane Kasper and CEO Dr. Dirk Forberger. Also part of the team was the anesthetist, intensive care and emergency physician, Dr. Jens Ebnet, who presented as a special highlight his invention "SWORDCATH®" - an innovative catheter system. For this product RoweMed is the development partner and supports especially the industrialization of this project. The days were filled with numerous discussions, meetings and customer visits. The first impression is extremely positive. Therefore, RoweMed will be exhibiting again at the fair in 2019 (05. - 07. February) - and again at the German Pavilion. In the next few weeks, however, it will be important to pursue the numerous contacts, to acquire projects and to continuously develop the business relations. Please find here an article published in the local press. 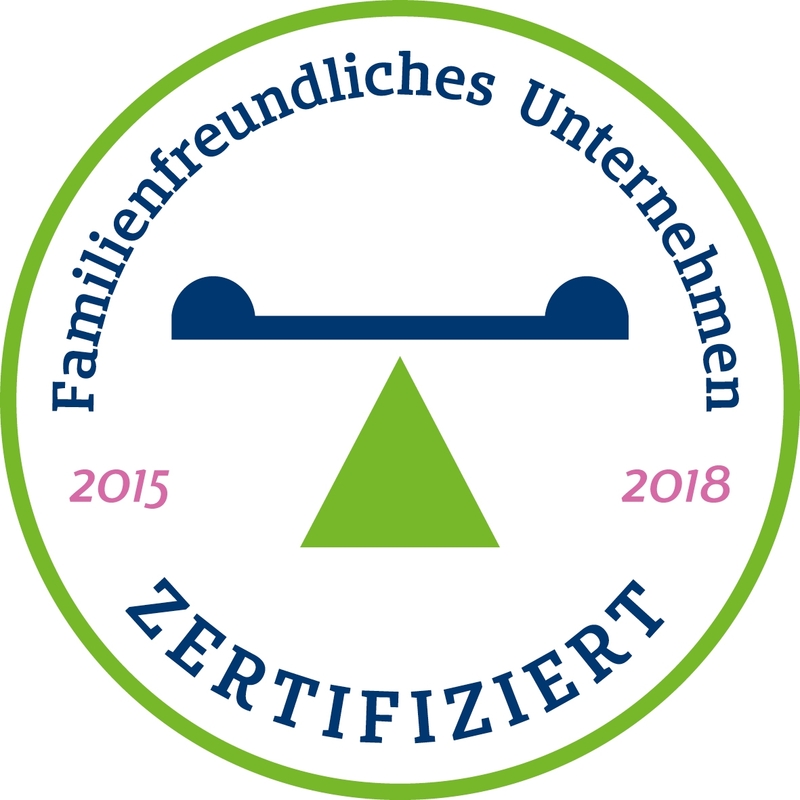 On October 19, 2015, the RoweMed AG received the "Family-friendly company" - certificate. The award is given to local companies, with special commitment for its employees. The local paper article can be found find here. Also read the article in the local press. The french trade press published an article about RoweMed AG, on the occasion of the Pharmapack 2016 trade show in Paris. 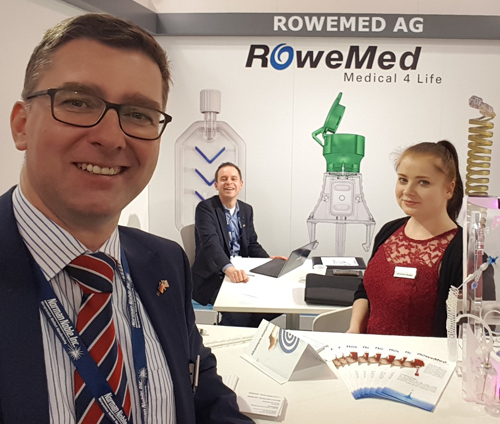 On 26.05.2015 the Minister for Economic Affairs, Building and Regional Development of Mecklenburg-West Pomerania Harry Glawe (CDU) visited the company RoweMed AG - Medical 4 Life at your site in Parchim. After detailed discussions, a tour of the company took place. The Minister for Economic Affairs Glawe especially complimented the high proportion of women and older workers in the company. The Minister of Economic Affairs was able to convince himself of the entire product range on site. "The RoweMed AG has developed into a sought-after provider of medical standard and customized solutions. Especially via the intensive research and development activities of the 90 employees at the location Parchim it has been successfully managed to distribute innovative and marketable products from Mecklenburg-Vorpommern worldwide", said The Minister of Economic Affairs Glawe. 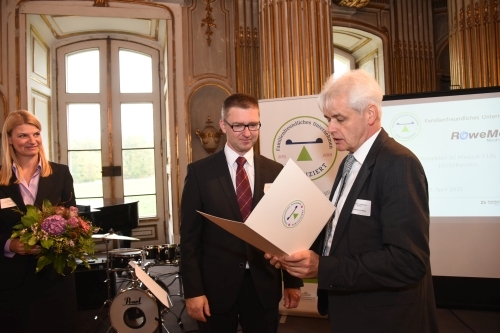 The company RoweMed AG - Medical 4 Life was honored by the Wirtschaftsfoerderungsgesellschaft Suedwestmecklenburg mbH with the seal "Family-friendly company". This seal is awarded to companies that support their employees active and creative in reconciling work and private life. As the first company RoweMed AG - Medical 4 Life gets this seal for its family-friendly policies. The company RoweMed AG - Medical 4 Life is a member in the working group medical technology of the VDMA (German Mechanical and Plant Engineering Association) since October 2014. The working group was founded in March 2014 and has already 147 members (last updated: 11. September 2014). It should provide their members a platform for exchange in the area of production technology for the medical technology. Furthermore the economical, technical and scientific interests of the medical technology provider should be represented and promoted. Additionally the dialog between physicians, medical technology manufacturers and mechanical engineering including electrical automation and software should be strengthened. The company RoweMed AG - Medical 4 Life was awarded "Company of the year 2014 Mecklenburg-Western Pomerania" by the East German Savings Bank Association. 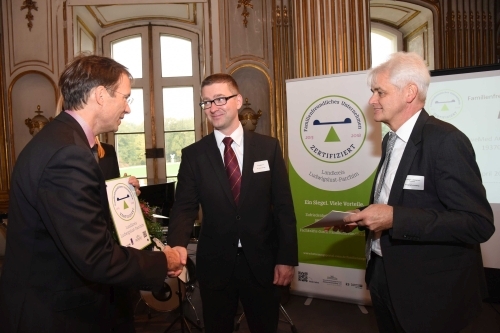 The awards ceremony took place on the 27.11.2014 in Potsdam. This popular price was awarded for the 18th time this year. The award "Company of the year" honors companies, which prove to be successful in the market through modern marketing activities and creative potential and whose steady growth helps to create permanent jobs. 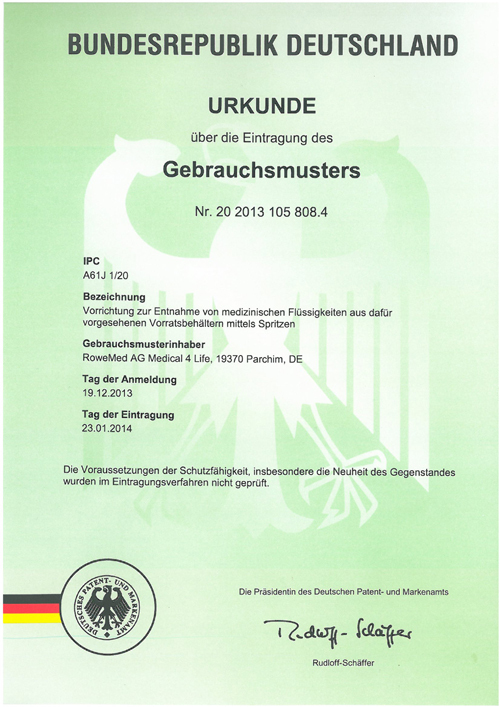 The Company RoweMed AG - Medical 4 Life received a certificate for the enrollment for utility models into the register of the German Patent and Trademark Office. 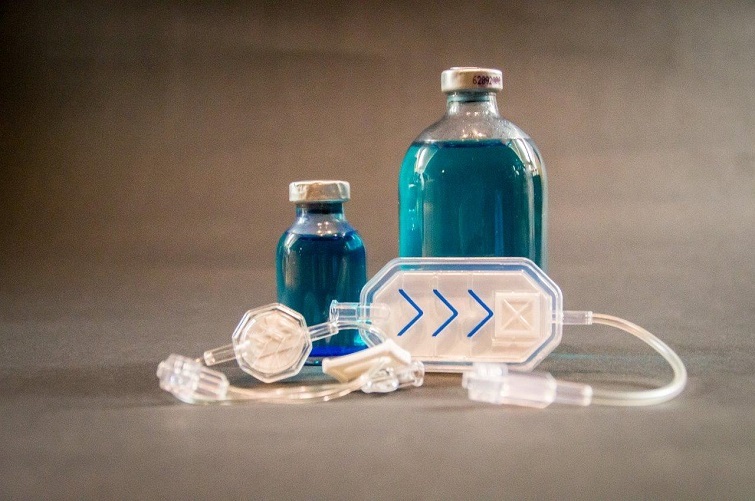 A device for a safe withdrawal of medical liquids was developed. The liquids are taken from a special provided storage container through needle free syringes. The feature of this new device is an integrated back check valve. As a result of that the liquid can only be transported one-sided. The injection back into the storage container is prevented and the contamination of the drug will be avoided.